Texas, Florida, Ohio State: Facebook map of college football fan bases. Texans love Texas football, according to data released by Facebook on Friday—and so do New Mexicans, Coloradans, Missourians, and North Dakotans. The Longhorns, in fact, have the most Facebook fans of any current top-25 college football team in 543 different counties around the country. That gives them, by at least one imperfect metric, the nation’s widest fan base. Florida, meanwhile, not only dominates its own state in Facebook likes, but counties strewn across Tennessee, North Carolina, and much of New England. Ohio State captures every county in Ohio, plus Northern Kentucky, Western Pennsylvania, much of West Virginia, and pockets of Arizona and Nevada. 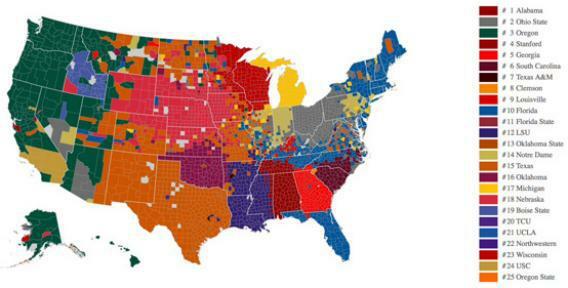 The map makes good fodder for trash-talk as the college football season kicks off this weekend. But if someone tries to lord it over you by pointing out her team’s relative superiority on what Deadspin was quick to call “the best map of college football fandom,” you do have some options for comebacks. The most obvious limitation in Facebook’s data is that it’s based on likes of each team’s Facebook page. So your team’s poor showing may have as much to do with a weak social-media strategy than a true dearth of support. Or, put another way—maybe your team’s fans have better things to do than click the “like” button on official team Facebook pages. In any case, Facebook likes don’t count for much on the field, as the San Francisco 49ers found out earlier this year. Another distortion comes from the fact that Facebook only looked at fans of the nation’s top 25 teams. That enabled Oregon, for instance, to sweep the state of Washington, since neither Washington nor Washington State was eligible. And Texas and Nebraska would not have been able to divide up Colorado had the Buffaloes been in play. By the same token, the formula disadvantaged SEC teams, since they all have close neighbors in the top 25. Finally, the use of counties as the unit of measurement is misleading, since some counties are far more populous than others. Los Angeles County, for instance, has nearly five times as many people as the entire state of New Mexico. Still, there are a few interesting observations to be gleaned here, including the lopsidedness of the South Carolina/Clemson, Oregon/Stanford, and Texas/Texas A&M rivalries. In each case, the former team carries scores of counties spanning multiple states while the latter holds just one or two. The biggest mystery, meanwhile, is why so many Northeasterners are rooting for Florida. The region is in play partly thanks to Boston College’s absence from the rankings, but do New Englanders really not have a better alternative than faraway Florida? *Correction, Friday, Aug. 30, 4:25 p.m.: This post originally stated that Northwestern’s hometown fans were outnumbered by those favoring Wisconsin. In fact, the team with the most Facebook fans in Cook County, Ill., is Michigan.